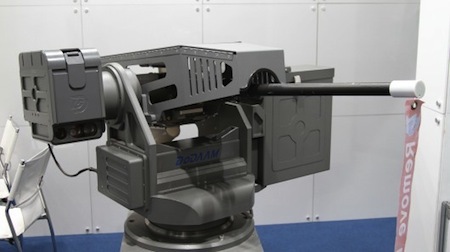 The Super aEgis 2 is an autonomous robot sentry gun developed by South Korean gun maker DoDAMM. It can autonomously lock on to human targets from several kilometers away. The Super aEgis 2 is an automated gun tower that can find and lock on to a human-sized target in pitch darkness at a distance of up to 1.36 miles (2.2 kilometers). It uses a 35x zoom CCD camera with 'enhancement feature' for bad weather, in conjunction with a dual FOV, autofocus Infra-Red sensor, to pick out targets. Then it brings the pain, either with a standard 12.7mm caliber machine-gun, a 40mm automatic grenade launcher upgrade, or whatever other weapons system you want to bolt on to it, including surface-to-air missiles. A laser range finder helps to calibrate aim, and a gyroscopic stabilizer unit helps correct both the video system's aim and the direction of the guns after recoil pushes them off-target. SF fans probably read about this idea first in The Andromeda Strain, the 1969 novel by Michael Crichton. He describes automatic guns that secure the inner core of a government research facility. Some fans have put forward the stationary automatic blaster from Robert Heinlein's 1949 novel Red Planet, but I don't think it quite qualifies. The robot guns from Alan Dean Foster's novelization of the movie Aliens (1986) is a good example. In the real world, automatic guns that target and fire date from WWII. The SCR-584 anti-aircraft gun laying radar was a highly accurate system developed early in the war. Take a look at the 2006 version of this technology - South Korean Intelligent Surveillance and Guard Robot.